My personal commitment to diversity, equality, and inclusion runs strong and deep. From an early age I was taught about the importance of respect and acceptance, and they are central to my core beliefs. 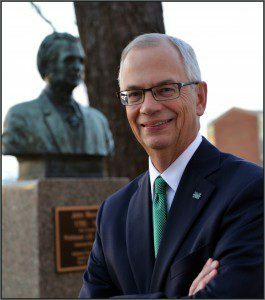 I am proud that the Marshall University Creed states that we are a community that embraces the expansion of knowledge, defends individual rights, and promotes civic responsibility. It is important for an educational institution to convey to its constituents the values that we would hope all would embrace. By affirming our strong stance in support of diversity, equality, and inclusion, Marshall University is seeking to create a rich learning environment in which to educate students and develop them as leaders. My goal is for Marshall University to be a place free from all forms of discrimination and disrespect, a place where all people feel welcome and all opinions are respected. The Commission will help us focus on activities and programs that will promote a stronger and more diverse Marshall family.